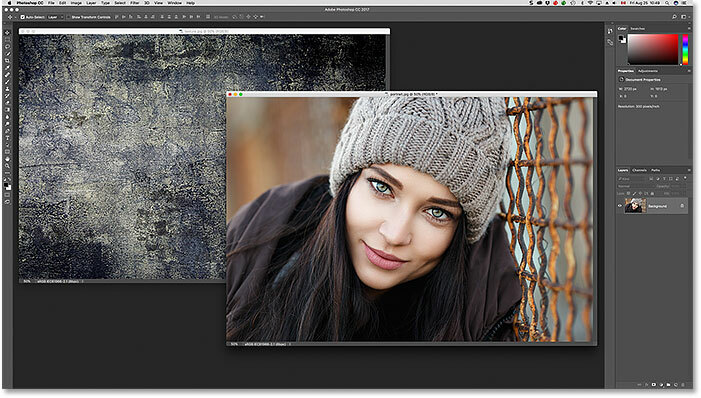 This tutorial shows you how to move an image or a layer from one Photoshop document to another. You'll learn how to copy and paste an image between documents, how to duplicate a layer, and three ways to drag and drop images between documents. 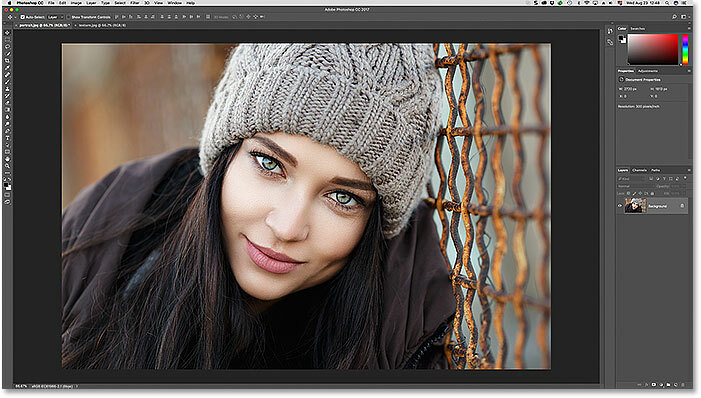 When it comes to blending and compositing images, Adobe Photoshop is the undisputed champ. In fact, Photoshop gives us so many interesting and powerful ways to combine images that our creativity is limited only by our skills and imagination. But before we can start combining images, we first need to know how to get multiple images into the same document. 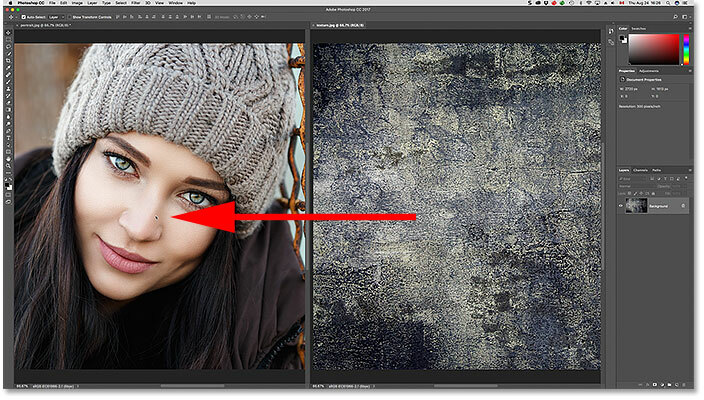 If you're new to Photoshop, blending even two photos together can seem like an impossible task. That's because Photoshop opens each image in its own separate document. To blend or composite the images, they need to be in the same document. In a previous tutorial, we learned all about tabbed and floating document windows in Photoshop. We also learned how to view and arrange multiple open images on the screen using Photoshop's multi-document layouts. In this tutorial, we'll take what we've learned and explore five different ways to easily move images between documents. We'll start with your basic copy and paste method. Then, we'll learn how to duplicate a layer from one document into another. Finally, we'll look at three ways to drag and drop an image between documents. We'll learn how to drag and drop images between tabbed documents, between documents in a multi-document layout, and between two floating document windows. Once you've seen how they all work, you can pick the method you like the best! I'll be using Photoshop CC but this tutorial is fully compatible with Photoshop CS6. This is lesson 8 of 10 in our Learning the Photoshop Interface series. Let's get started! Selecting and opening two images into Photoshop from Adobe Bridge.. The first of two photos open in Photoshop. Photo credit: Adobe Stock. Clicking the document tab to view the second open image. The second image. Photo credit: Adobe Stock. The first method we'll learn for moving images between documents is how to copy and paste an image from one document into another. To copy and paste an image, first select the document that holds the image you want to move. With the document active, select the image inside the document by going up to the Select menu in the Menu Bar and choosing All. To copy the image, go up to the Edit menu and choose Copy. Switch to the document where you want to paste the image. 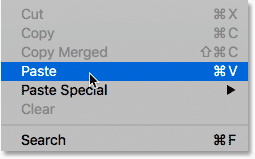 Then, go up to the Edit menu and choose Paste. 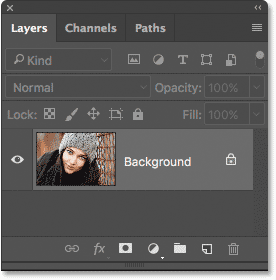 The pasted image will appear on its own separate layer above the original image in the Layers panel. Selecting the document that holds the image to be copied. Selecting the document where I want to paste the image. The Layers panel showing the document's original image. 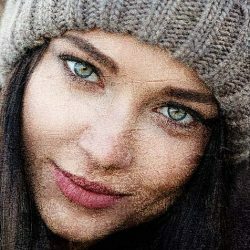 The "texture.jpg" image has been pasted into the "portrait.jpg" image's document. The Layers panel now showing both images in the same Photoshop document. Going to Edit > Undo Paste. Going to Select > Deselect. Next, we'll learn how to move an image from one Photoshop document to another by duplicating the layer. First, make sure the document that holds the image to want to move is selected. Go up to the Layer menu in the Menu Bar and choose Duplicate Layer. 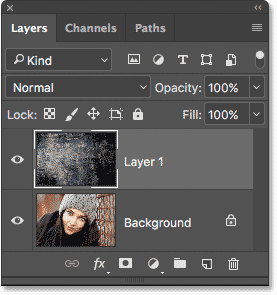 In the Duplicate Layer dialog box, give the layer a name (optional). In the Destination section of the dialog box, choose the other document as the destination. Then, click OK. The image will appear on a new layer in the other document. Selecting the document that holds the image to be moved. 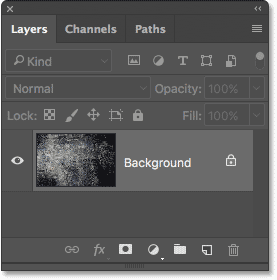 The Layers panel showing the texture photo. Going to Layer > Duplicate Layer. This opens Photoshop's Duplicate Layer dialog box. At the top of the dialog box, it shows the name of the layer you'll be duplicating. In my case, it's the Background layer. 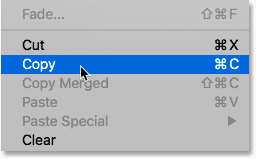 By default, Photoshop simply adds the word "copy" to the end of the layer's original name. This will become the name of the layer ("Background copy") when it's moved into the other document. 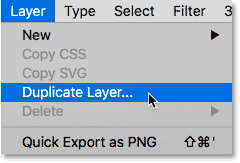 But you can give the duplicate layer a more descriptive name. 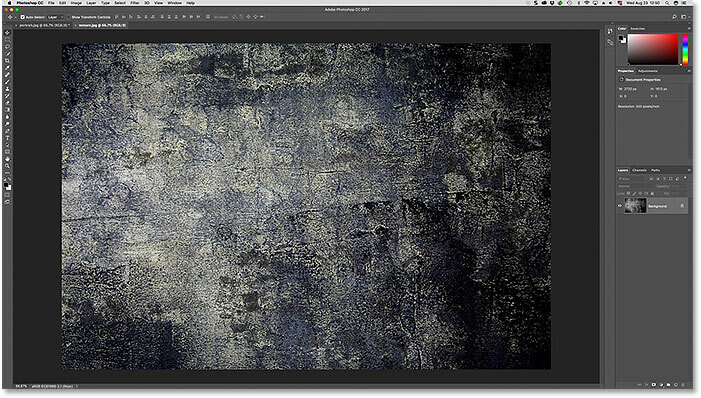 Since this layer holds my texture image, I'll change the layer's name to "Texture". Setting the other document as the destination for the layer. Clicking the tab to switch documents. The texture layer has been duplicated into the portrait document. Going to Edit > Undo Duplicate Layer. The next few ways we'll look at for moving images between documents all involve dragging and dropping the image. We'll start by learning how to drag and drop an image between tabbed documents. First, select the document that holds the image you want to move. Select the Move Tool from the Toolbar. Click on the image and drag it up and onto the tab of the other document. Wait for Photoshop to switch documents. Then, drag the image from the tab down into the document window. Press and hold your Shift key and release your mouse button to drop and center the image in the document. Clicking and dragging the texture image onto the portrait document's tab. Once Photoshop switches documents, drag the image into the document. Hold Shift and release your mouse button to drop and center the image. Going to Edit > Undo Drag Layer. We've seen how to drag and drop between two tabbed documents. Now let's learn how to drag and drop an image between documents using one of Photoshop's multi-document layouts. We learned all about multi-document layouts in the previous tutorial. Go up to the Window menu in the Menu Bar, choose Arrange, and then choose the 2-up Vertical layout. This places your two documents side by side on the screen. Select the Move Tool from the Toolbar. Click on the image you want to move and drag it into the other document window. Press and hold Shift and release your mouse button to drop and center the image in the document. Go up to the Window menu, choose Arrange, then choose Consolidate All to Tabs to switch back to the default tabbed document view. Going to Window > Arrange > 2-up Vertical. Both images are now visible on the screen. 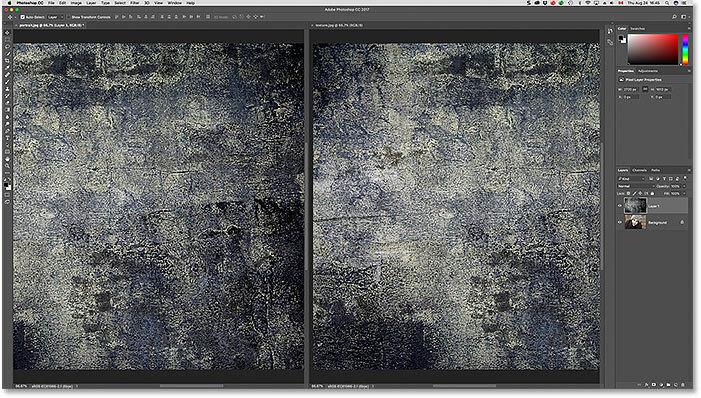 Dragging the texture photo into the other document beside it. Step 5: Choose "Consolidate All to Tabs"
Going to Window > Arrange > Consolidate All to Tabs. Back to the default tabbed document view. 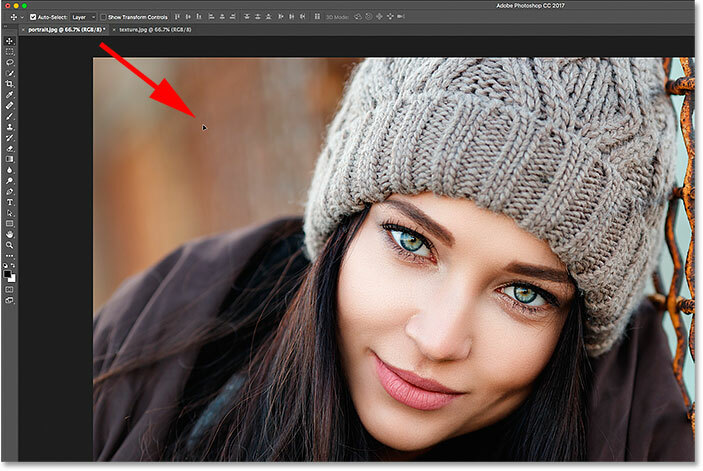 Finally, let's learn how to move an image from one document to another in Photoshop by dragging it between two floating windows. Go up to the Window menu, choose Arrange, and then choose Float All in Windows. Both images will be visible inside their own floating document. Select the Move Tool. Click inside the window of the image you want to move and drag it into the other window. Press and hold Shift and release your mouse button to drop and center the image inside the document. To revert back to the tabbed document view, go up to the Window menu, choose Arrange, and then choose Consolidate All to Tabs. Going to Window > Arrange > Float All in Windows. Each photo appears in its own floating window. Dragging the image from one window into the other. The texture photo now appears in both windows. Back to the tabbed document view once again. 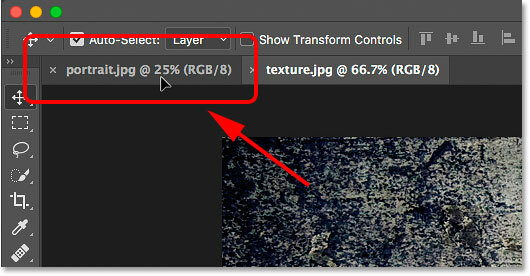 Now that we know how to move images into the same Photoshop document, how do we blend them together? At the moment, my texture image is completely blocking my portrait photo from view. 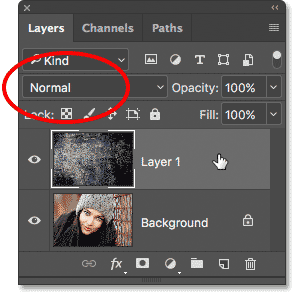 To blend the two images, we can use one of Photoshop's layer blend modes. I'll go through this quickly here, but you can learn more about blending images in our How To Blend Textures With Photos tutorial. The blend mode for the texture layer is set to Normal. The result after changing the blend mode of the texture layer to Soft Light. And there we have it! 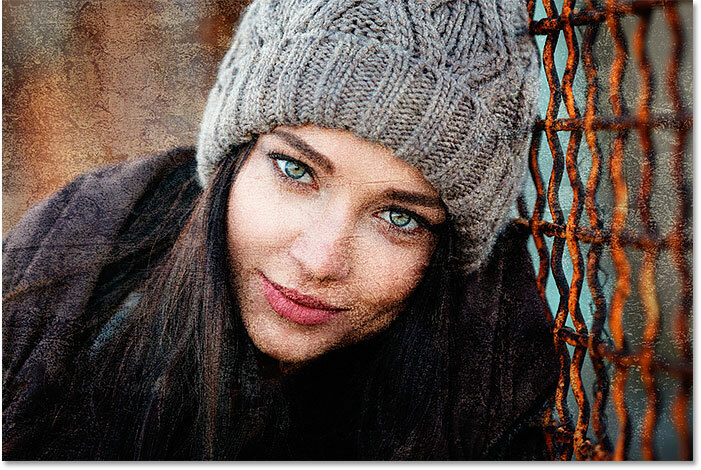 That's five easy ways to move an image between documents in Photoshop, along with a quick look at how to blend your images together using blend modes! In the next lesson in this series, we'll learn how to use workspaces in Photoshop!